These scanner hooks hold multiple hanging items simultaneously on one hook and displaying the scanner tag on the other. 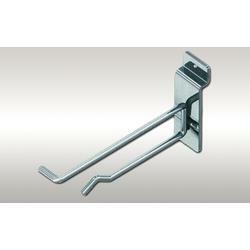 Hooks have a sturdy rear plate that slips right into your slatwall for simple placement. These hooks do not occupy much space making them easy to combine to create a display area that fits your needs.